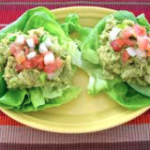 In a medium bowl mash together avocado and greek yogurt until smooth. Stir in garlic, onion powder, sea salt, and pepper. Squeeze in half the juice from the lime. Taste and add more lime juice to suit taste. 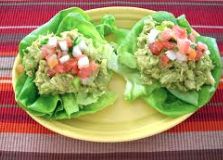 Serve in lettuce wraps, or in whole grain wrap, pita or anyway you would like to enjoy your avocado chicken salad!